More than one-quarter of the country’s 25 fastest-rising real estate markets are in the Bay Area. Oakland ranks No. 5 on the list, boosted by rising home values and incomes. According to MLS data, the median sales price for a single-family home in Oakland reached $825,000 in April, the highest in two years. 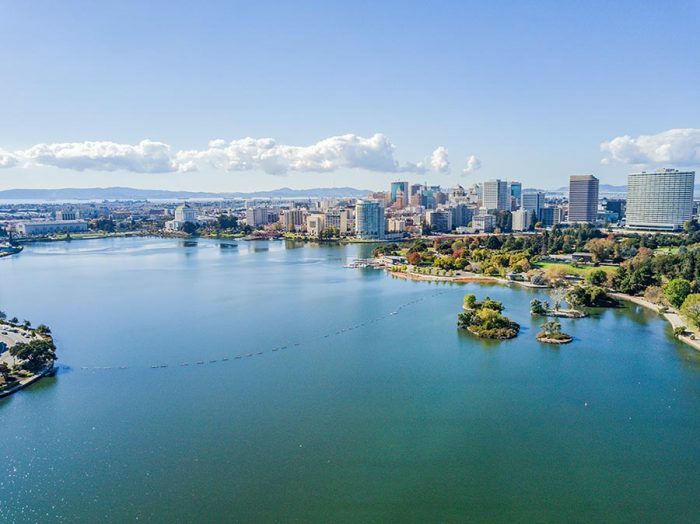 During the current housing cycle, Oakland has become a hot spot for Bay Area homebuyers who are priced out of San Francisco, so it’s hardly surprising that a new study ranks the city as one America’s fastest-rising real estate markets. An analysis from SmartAsset determines the country’s top 25 rising housing markets on a 100-point scale based on housing demand, change in home values, and change in incomes between 2012 and 2016. More than one-quarter of those booming housing markets are in the Bay Area, with East Bay cities making a strong showing. Based on the criteria above, Oakland ties for No. 5 on the list of the country’s top rising real estate markets, with a score of 92.70. Since 2012, home values in Oakland have appreciated by 11.27 percent, while median incomes have risen by 11.79 percent. The number of new residents in Oakland has also outpaced the number of new housing units by more than 6 percent. Oakland’s rising home prices and exceptionally low inventory reflect intense homebuyer demand in the city. According to MLS data, Oakland’s median single-family home sales price reached $825,000 in April, the highest in at least two years and up by 9.3 percent year over year. There was a 1.2-month supply of homes for sale in April, meaning that the market leans heavily in favor sellers. Bidding wars remain common, with Oakland homes selling for an average of 117 percent of original price last month. Oakland’s Alameda County neighbors Hayward and Fremont also make the list, ranking a respective No. 13 and No. 14. With a 90.68, Hayward saw home values increase by more than 20 percent, while Fremont scores a 90.46 based on double-digit percent home value and income gains. Elsewhere in the East Bay, Contra Costa County‘s Concord comes in at No. 21, notching an 85.19. San Francisco and San Mateo round out the Bay Area’s presence on the fastest-rising housing markets list, both tied with Portland, Oregon at 23rd and scoring an 84.85. Income growth was particularly strong in San Francisco at 18.83 percent, the second-highest gain of any city included on SmartAsset’s list.